How long have you been with Season + Taste and what’s your background? I’m originally from Italy and have worked for Season + Taste for about three and a half years. I started as a waitress in Bravas and Bakers and Co. I was studying at the time doing a Marketing and Business Management masters degree. 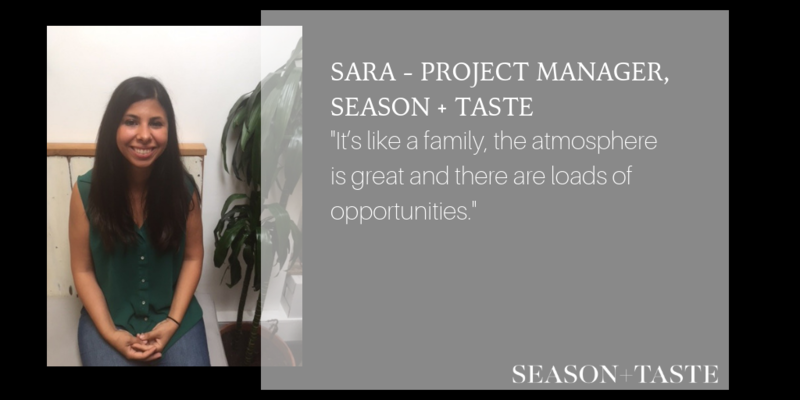 Why did you join the Season + Taste group and what’s your role? When I finished my masters I was about to leave and they said you can do what you studied here. So I started getting more involved with marketing and business development. I Learnt so much about accounting and the admin side of the restaurant. The role progressed and last year when we opened Cargo Cantina I went to Mexico to start helping with the opening and since then I’ve been project managing for the group. It’s like a family, the atmosphere is great and there are loads of opportunities. You are always learning and developing. Plus, you’re free to do your job. You can’t get too stressed, everyday something is going to happen. It’s not always going to be right, so you have to be prepared, but there’s so much satisfaction in knowing that you can get through it. What would you say to people who are thinking of joining the team? It’s not just one career path, you can do so much more. If you have skills you can use those skills and then combine them all together. A lady who worked for Cantina was a designer and now does all the design for us. Someone else is really into her music so is now putting on a few gigs and nights at corner 77. It’s not just about serving tables. Where do you see your role progressing? I always wanted to open my own place but i’m not ready just yet and and what i’m doing now is sending me in the right direction. I’m learning how to open and set up- we’ll see what’s going to happen. And it’s nice to feel supported in that and that it’s not any competition. Which is your favourite Season + Taste venue? Bravas as I worked there first and Cantina because I opened it and did it for the first time you know. You feel a sense of ownership.